The first time I saw this umbrella, I must admit that this is something that would look really nifty. The design is very much contemporary and modern which reminds me of a Scandinavian furniture brand. The aqua blue color is a sure eye-candy to anyone and most especially keen and appealing to anyone from the younger generation. Here are a few things that I like best about the Blunt umbrella. 1. Stylish design – I must admit, it is not really a guy thing. I personally prefer the non-eye catching one such as black or gray. But the color does seem to catch anyone’s attention. It is inevitable to anyone’s eye. The other best part about the Blunt umbrella, compared to others or traditional umbrellas is it doesn’t have sharp spikes around the edges. So you should not worry about causing any accidents just by opening your Blunt ones. 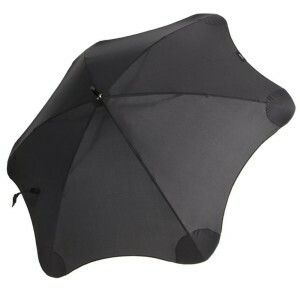 No more pointy rib tips and eye poking, just a safe umbrella during rainy and windy season. 2. Durability – the ribs are made up of fiberglass which is lightweight and sturdy. The Blunt umbrella has been tested to hold against 117 km/ h wind which is very much the circumstance in the normal English weather. Never worry about your umbrella turning inside and out eventually ending up in the bin! 3. Quick dry polyester fabric – of course, I bought an umbrella to protect me against heavy downpour. But one brand should stand out against the other. Going inside a building with your umbrella dripping wet could be an awkward situation that you can avoid when you have the Blunt umbrella. 4. Radial Tensioning System – this is one of its best feature, which keeps this umbrella efficient than anything else. This technology enables to hold tension and keep the fabric away from normal wear and tear, never worry about having to replace your dear ol’ umbrella year after year after year. The Radial Tensioning System (or RTS) creates an unflappable and aerodynamic weather canopy – compared to cheap ones, it should keep you covered under any sort of weather. I should not really say it is a negative feature. The price is about £44.00 per umbrella but looking at a bright side, this umbrella is as sturdy as a metal taking in strong gusts of wind leaving you without a worry of buying another umbrella after its first use. Sure, there are cheap umbrella that can provide you with the protection but how long do they usually last? As a smart consumer, I always make sure that I get my money’s worth. The revolutionary Blunt umbrella is sure to give you more than what you have paid for. I have sure tested these among the strong winds of an English autumn setting. My friend who has recently bought a new cheap one definitely didn’t get what she paid for, instead it went straight into the bin.